“To Fear or Not to Fear,” that is the question many of us ask ourselves these days as we read more and more dire prophesies and predictions for this month’s “September to Remember.” We have no way of knowing how future events will transpire, nor how they will affect each of us individually or as a whole. There are some quantum theory scientists that suggest life on this planet is merely an illusion within a hologram. We are creating it with our thoughts, our fears, our desires, and even our expectations as we “strut and fret our hour upon the stage” as Shakespeare would say. We are all playing our cosmic and karmic roles during this human transfiguration process. As divine spiritual beings we know on a soul level, that all will work out well as divinely planned. This is not to suggest that we should all docilely accept everything we are being told. Much in the world is being revealed as inaccurate as we awaken in consciousness to greater truth. It is apparent we have been deceived for decades by many of our leaders, the mainstream media, and the corporate oligarchy. As individuals, it is important that we seek out our own individual TRUTH, that is devoid of hate, intolerance, manipulation, greed and, of course, FEAR. 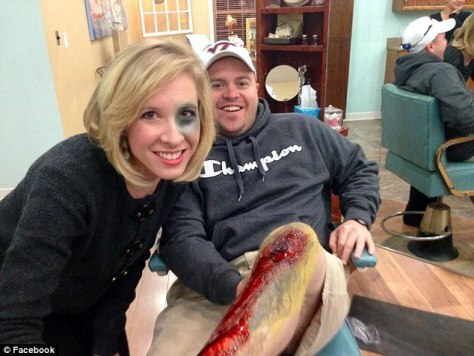 This is why it is important to recognize FALSE FLAGS. False flags, the acts carried out by “military or security force personnel, which are then blamed on terrorists,” are beginning to occur more frequently. 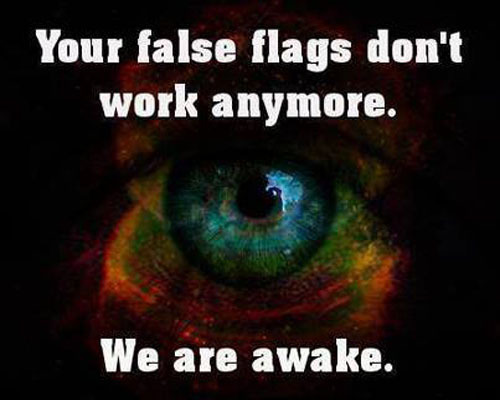 Identifying the tell-tale signs of a false flag event is crucial to disconnecting from fear and seeing it for what it is—mass manipulation. 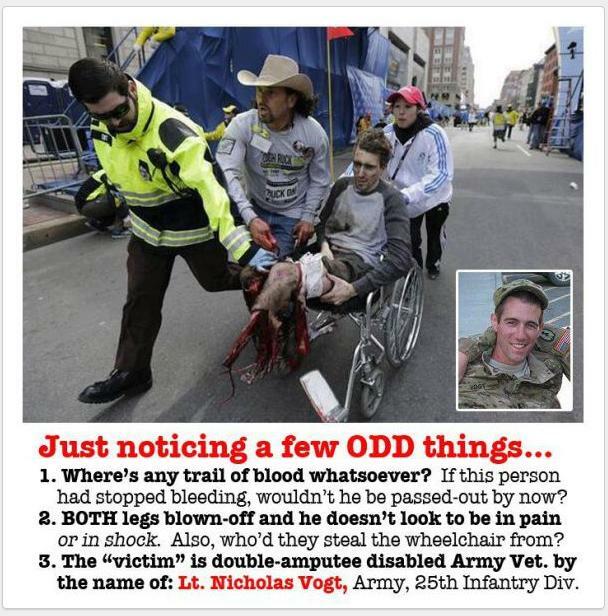 THE BOSTON MARATHON BOMBING: On the day of the bombing, the Department of Homeland Security and FEMA were conducting “counterterrorism drills” at the race which they referred to as “Operation Urban Shield”. This explains why operatives were on the scene so quickly. One running coach reported witnessing bomb sniffing dogs and authorities proclaiming a “drill” was underway at the marathon finish line. This pattern makes it clear that the attack came with the prior knowledge of, and perhaps participation of the government. Street photos from those watching the marathon near the finish line, show official-looking operatives with backpacks and communications gear near the bomb site beforehand and immediately after the bombing. While some participants really were seriously hurt, facial recognition software suggests some were clearly crisis actors (SEE PHOTO). The Department of Homeland Security admits that the real thing was eerily similar to the ‘”drill”. So WHY the Bombing? If you will recall immediately after the bombing, Boston was put under “martial law” and residents were forced to leave their homes so military could search without warrants. This was probably to see how people would respond to future martial law scenarios. Unfortunately, only a few people protested about the infringement on their rights and property. The last time the U.S. conducted such a massive war drill along its eastern coastal regions was on September 11, 2001 when the aircraft flying over the United States, and air controllers directing them, became so confused as to what was a real and what was false, the World Trade Centers in New York and the Pentagon in Washington D.C. were able to be successfully attacked killing thousands. Many people still have no idea that there was a massive “drill” going on that same day, which is why NORAD was told to “stand down.” Everyone thought it was part of the exercise drill. In light of all these recent developments, we should remember it was 9-11 that got us into the Iraq War. A war that was not only unnecessary (unless you were in the big oil business), but which also took many precious lives. This war served to further de-stabilize the Middle East and make the U.S. even more enemies. Perhaps we need to return to the days of the 70’s Peace marches and make our voices be heard that the time is for peace and cooperation, not war and greed. In Moldova this week, over 400,o00 protesters took to the streets demanding their president’s resignation and to prosecute the bankers that had committed bank fraud and ruined their economy. We are all awakening to consciousness during this time. It is becoming more difficult to hide the truth from the collective consciousness. We are learning to see through the lies, to diffuse the fear-based human ego, and know that united we are stronger than the few that govern over us. I sincerely hope Boston and all its people are safe this month, despite any scheduled role-playing “drills.” Who are we looking to blame next for our false flags—Russia, Syria, China? It’s a good time to stay vigilant, discerning, and focus on a massive amount of Healing Light that will engulf us all.